Posted on 04/04/2015 by Todd	This entry was posted in Gel and tagged Signo 207, Signo 307, Uni-ball. Bookmark the permalink. I like the look of this too! Always found the silver painted plastic on the 207s to be tacky. Hope they are making 0.38s as well! 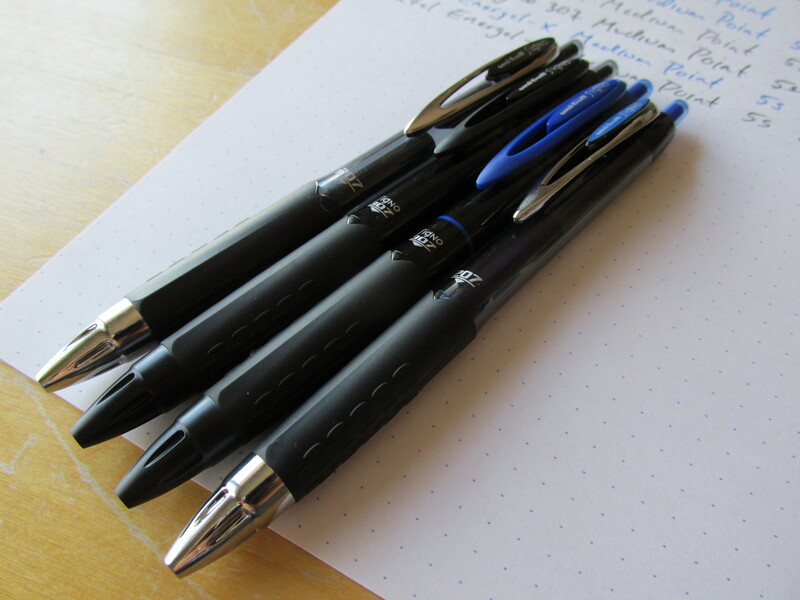 They all look good, both pleasure to write with, but there is one dissapointing thing about Pentel Energels – they are not water- or whatever-proof in any way. Now I’m making a research including a lot of pens – ball point, rollers, fibre tip rollers, gel pens and so on. 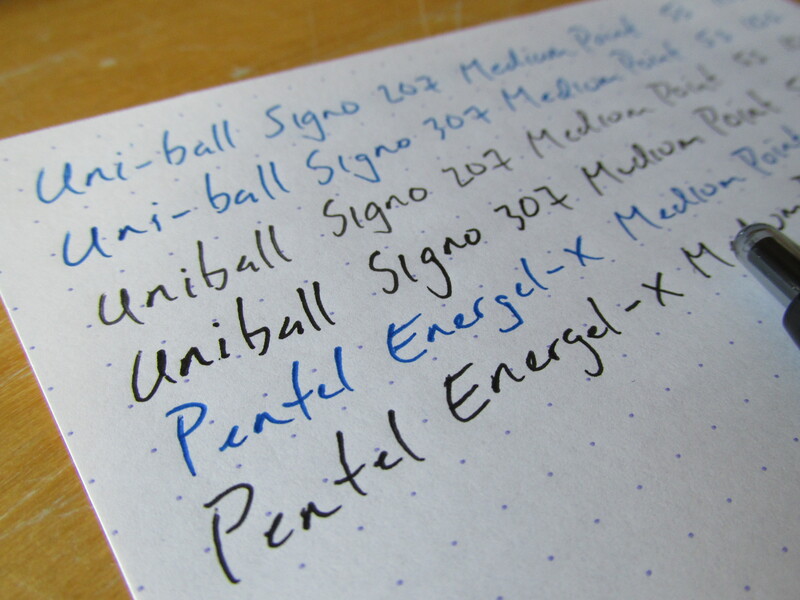 Pentel Energel’s lines were gone for good in the first rows so it is not recommended for any of important papers, e.g. bank checks. Signos are much more resistant to water and chemichals, including chlorine bleach. Hi Oleg – thanks for stopping by. It’s true, the Energels are not water resistant but this is a complete non-issue for me. I probably hand write 2 checks a year (if that) and in the 4 decades I’ve been writing, I have never had water remove ink from something I needed or even from something I didn’t need. I still take the advice of my field biologist teacher regarding notebooks that might get wet – use a pencil. I also write maybe 2 checks a year, so I’d only need waterproof ink for maybe a lab notebook. Usually I don’t need _both_ unalterable and waterproof together. Hi again! Just wanted to ask what do you think about ball-point Schneider Slider Memo XB (or Slider Edge XB and Slider Rave XB of that family), sure if you have any experience with them? They look rather comfortable and pleasure to write with for me. Hi Oleg – While I generally like the ViscoGlide ink Schneider uses in their pen lines, I’m not a big fan on most of their pen bodies. The shape of the Memo doesn’t work for me and I recall thinking the Rave was too light when I pick it up at the store. I don’t really ever seeing a Rave in the store. So, good ink but not so great construction for me. Have you tested out their big claim for the 307: “writes on glossy surfaces”? Maybe the dry time is better than the energel on a glossy business card or magazine cover? I tried the Signo 307 on a glossy postcard and it did okay. 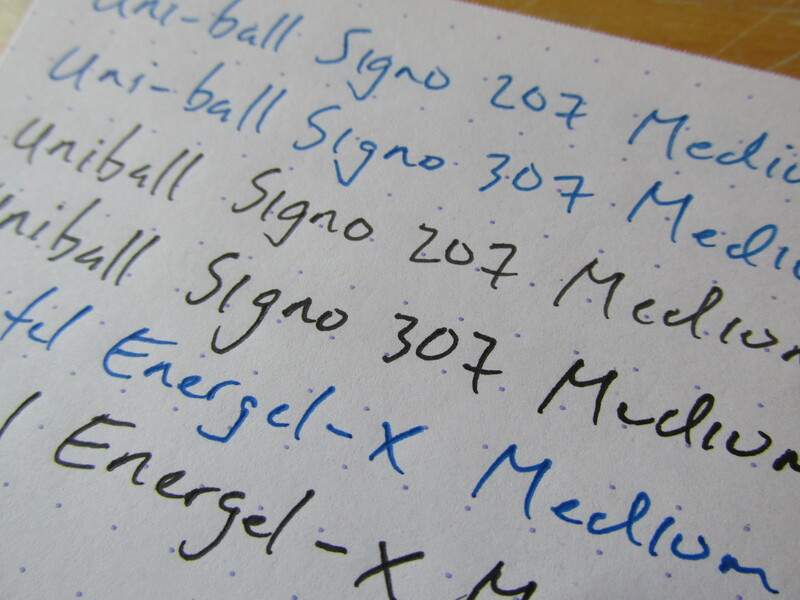 After an initial false start with the first stroke, the Signo 307 did write a reasonably consistent line. The dry time was very long though. The Energel did a little worse in terms of laying down ink on the postcard but about the same in terms of dry time. So, I think Uni-ball’s claim that the 307 works on glossy paper generally holds true but the dry times are long. I plan on keeping a 307 around for the holidays when it comes time to writing on the name card stickers for presents. Should work pretty well for that task. 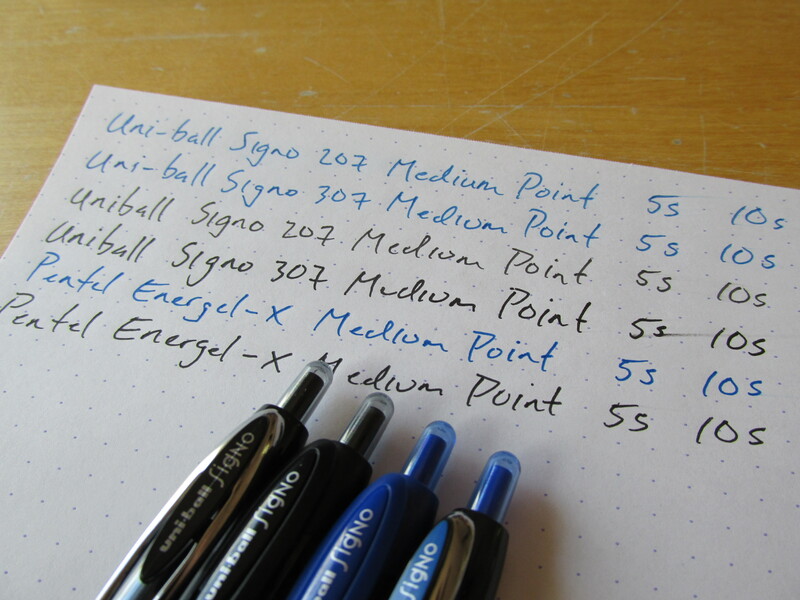 Just bought the 307….My go to pens are the Uniball Jetstream RT and Energel was hoping the 307 would give them a run but I came up with the same results as you did. I also like the Zebra Zmulsion EX Ball, hybrid ink very smooth!! Thanks for stopping by Thomas. I have not tried the Emulsion specifically, but I’m going to guess it uses the same emulsion ink as the Surari which I have tried. My recollection was that the pen was too smooth, almost slippery, for my taste. I know I have a couple of these in the bins somewhere. I’m going to dig them out and take another look.
. Thank you in advance. Not sure where you can get just refills for the 307, but I found my 3-pack of 307 pens at Target. I cannot find the 307’s anywhere. . .ugh. Everytime I like a new pen, they seem to dissappear. . .double ugh. Does anyone know where I can get these online even? Are they discontinuing the 207? I have zero info on Uni’s plans but I’d be very surprised if they discontinued the 207. Agreed, the 307 is clearly a marked improvement over the 207. I’m anxious to see if they make a 307 1.0? If so I’d love to give it a test drive and comment on it too. This 0.7 peforms better than a typical 0.7 so I can only imagine how the 1.0 will do. Hi Todd, can you tell me what part number is written on the 307’s ink cartridge? I love the UMR-80 from the 207 (1.0mm). Use it in a different pen body for check writing. Thanks! Have not been able to find refills for the 307. I suppose one could refill with a 207 cartridge but that is kind of a step backward it would seem. Was at Target today and despite a big stock of back-to-school stuff (isn’t it a little early?) there were only a few 207 and no 307s. I just finished speaking with Uni-Ball customer service. Refill are NOT available. But there are careless remarks suggesting that they do exist. My experience with the pen is that they write smoothly (but not slippery) and do not skip. The ink supply in the pens is small. So I have four dead pens on my desk that represent less than a month of using the “307”. As I had initially felt I’d found the ideal drug store pen because of its writing quality, I think differently now. They’re about $2.50 each where I am, that’s more than $130.00 a year. So, wonderful pen, but not a “drug store” pen. Too bad. We make a LOT of beautiful things in the USA that are thrown away soon after they’re used — and this CANNOT serve us well — and now this sweet little pen from Japan joins the club. Write to them and urge them to come to their senses. I have several 207’s still full of ink that don’t work so why would I trust this company again? Because, in general, the 207 is a very reliable pen. That said, they do have a shelf life. (Pilot’s similar G2 claims “Gel ink has a quality writing life of two (2) years.”) Most likely Sanford will replace your pens if you make a guarantee claim. There is no doubt a great deal of study and skill, judgement and care that goes into making a delightful pen. I have written before of my disappointment that refills are not available, and I still am disappointed. However, the balance of smoothness and a tactile feel for what the pen tip is doing is just perfect. Hats off to everyone involved in creating the Signo 307. I use them almost exclusively. Hold on to your receipt in case you get a “bleeder” (something that can happen with any pen).